1. 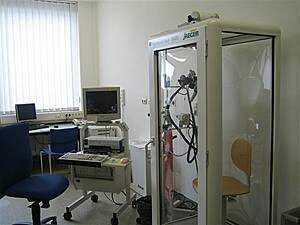 On a weekly basis I go to a physio therapist and we always measure the heart rate and the oxygene saturation. During the past few years the heart rate would always be between 80 - 90, the oxygene level 90% or lower. After I started with Kalydeco this changed drastically. Now my heart rate is 70 or lower and my oxygene saturation is always 95% or 96%. 2. Already the tiniest efforts resulted in a drastic increase of the heart rate, within seconds it would go to 110 and higher, whereas the O2 would do the opposit and drop to 85% and lower. Therefore it was almost impossible to perform exercises as it was simply too much for the body. Nowadays everything is more stable and I can easily do small exercises. 4. I managed to reduce cortisone from 7.5mg to 2.5mg. An crucial step for me since cortisone has a bad effect on the bones and the blood sugar level. My body gets less damaged now which is very important. But on the other hand it makes it difficult to compare the lung fuction test results; yes the values are only slightly better BUT I scored them with much less cortisone. A reader of this blog mailed me last september. She had several infections and just came out of the Hospital. She was looking for a new doctor because she was afraid that her current one did not have enough knowledge on CF. I explained her how happy I am with my doctor in St.Gallen and she thought about having an appointment there. She seemed really motivated and wanted to become again more active after the stay in the hospital. She wanted to improve her condition again. She had a similar history as I have, her FEV1 dropped within months from 50% to 25%. Last Friday I received a mail from her husband. She lost the battle. This is the perfidiousness of this disease. It can force you on your knees within months. Therefore it is so damn important that you always stay focused and that you appreciate every single day - you need to be happy about the smallest improvements and stay postitve. First, the incredibly sad news worried me... heavily. But now, and don't get me wrong, it's still such a tragic story, I take it as motivation. Motivation to stay focused, motivation to keep on fighting, do my exercises, go to the gym and stay strong. ...Or motivation to try something new. Like yesterday when I first tried to play badminton. And it went pretty well. Of course I was not running across the field like a mad man, but the easy moving is apparently the exact right thing to do at the moment. I try do this now on a weekly basis. It was really fun. Last but not least I want to show you the two graphs I put together - the FEV1 history of the past twelve years - and the small circle which shows the tendency since I started with Kalydeco. As already mentioned, it is only a small improvement BUT it is one and the direction is right. And after all, this is the most important fact.